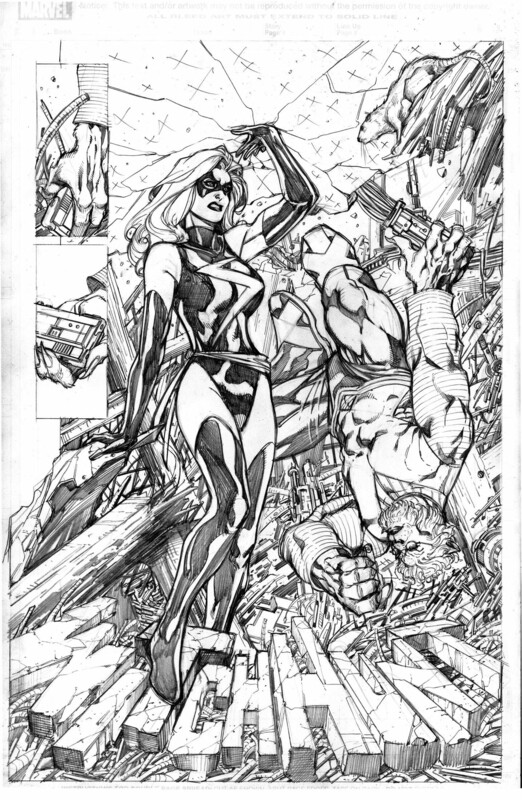 So many Ms. Marvel splash pages, so little time. 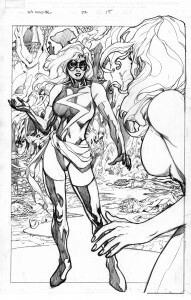 Well, I am going to wrap up this continuing thread with my final issues of Ms. Marvel #23 and #24. A whole blog on just two issues? I know it sounds incredulous but wait until you see how many splash pages and double page spreads were in those final two issues! 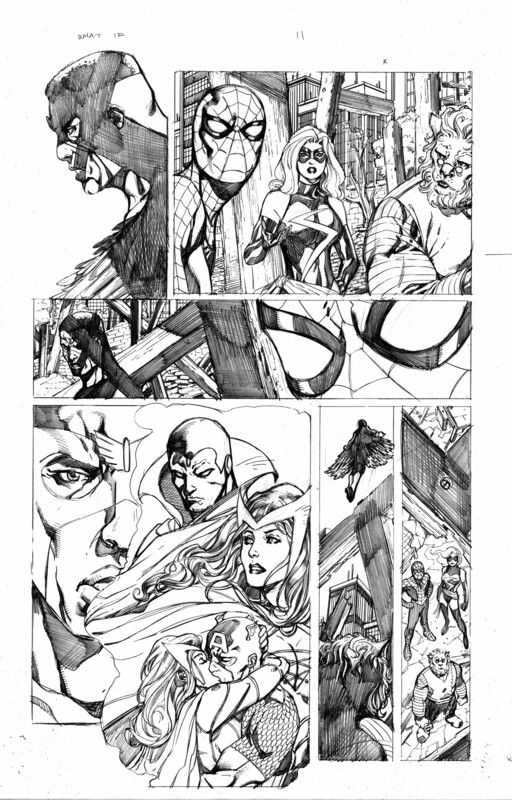 Again these are my penciled pages as I turned them into Marvel prior to inking. Let’s begin with issue #23. 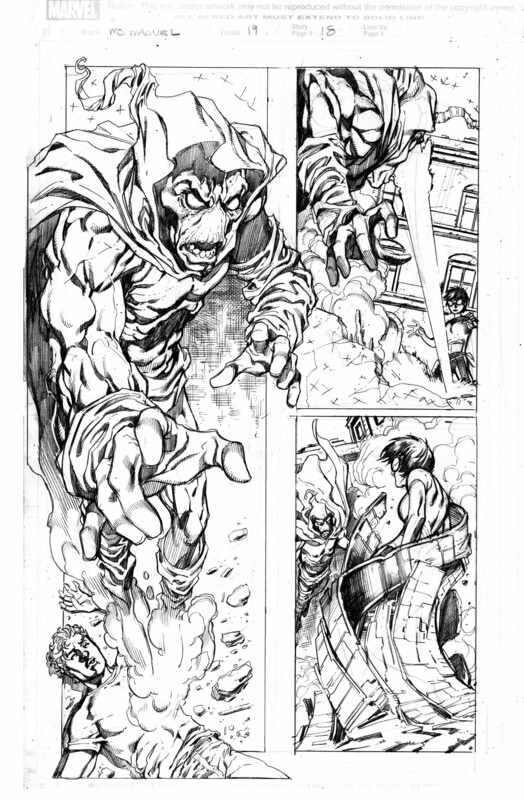 The first page was once again a panel page set up for a big payoff splash page on page 3. However, as usual I couldn’t leave well enough alone. 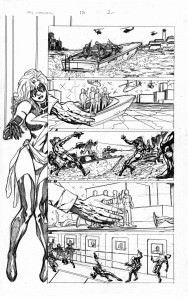 So in this issue Ms. Marvel becomes binary (sort of) so I worked in a full figure shot of her on the right side of the panel art as a framing device as I had been doing in so many of the previous issues. No good reason other than it looks cool. 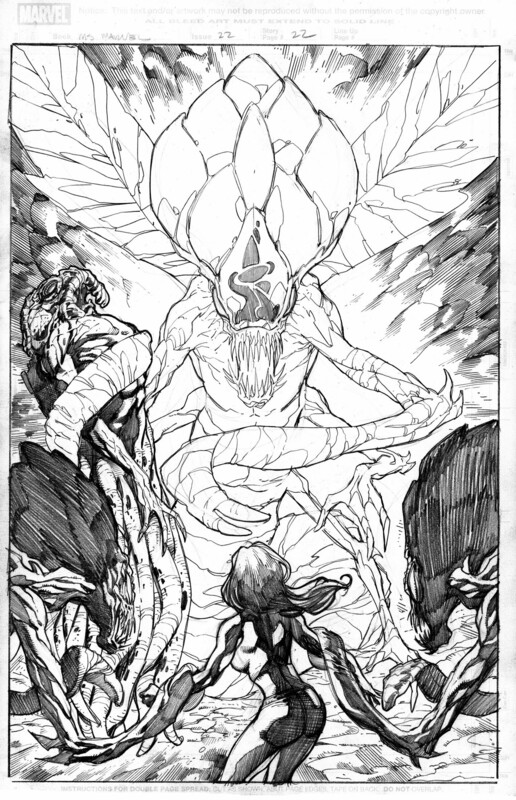 The page 3 splash features Ms. Marvel/ Binary facing off with the Brood Queen. Because of the sheer size of the Brood Queen I opted to favor her and show Binary from behind. 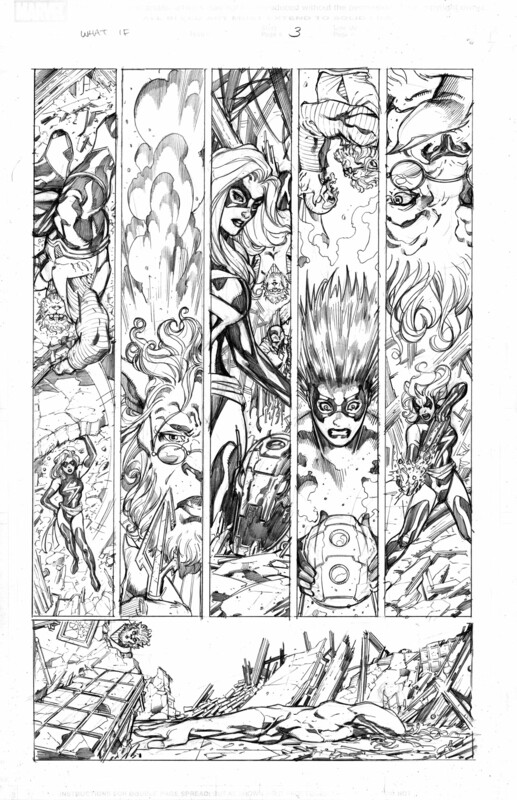 Just a few pages later we get another splash of Carol and the Brood Queen getting rocked. I can’t remember exactly the circumstances but there is some kind of mental battle going on here and since both were being thrust apart it allowed me to show both characters clearly. Carol being thrust toward camera and the Brood Queen rearing back in pain. The final page of the issue presents Carol as a new Ms. Marvel – Binary hybrid. Obviously this big reveal needed to focus on Carol and since we had seen the Brood Queen multiple times by this point I didn’t feel bad slighting her in the composition. 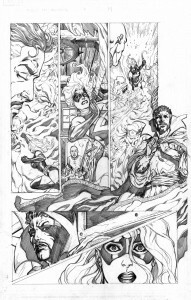 How often does an artist get to draw 4 splash pages in one issue? 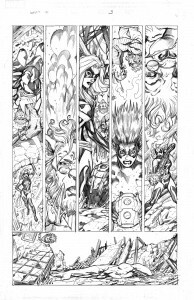 Keep reading and take a look at the final issue of my run on Ms. Marvel, it gets even better! 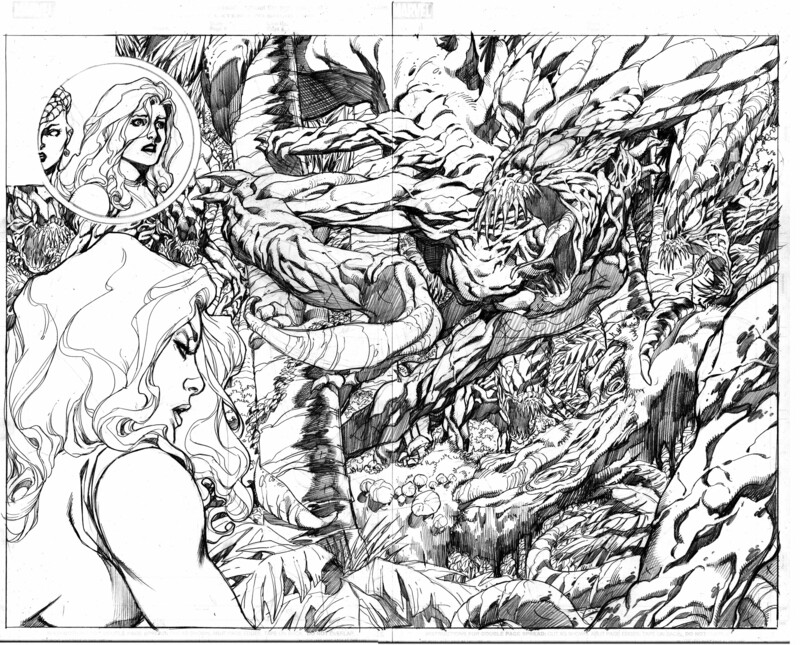 How about opening my final issue with a double page spread? 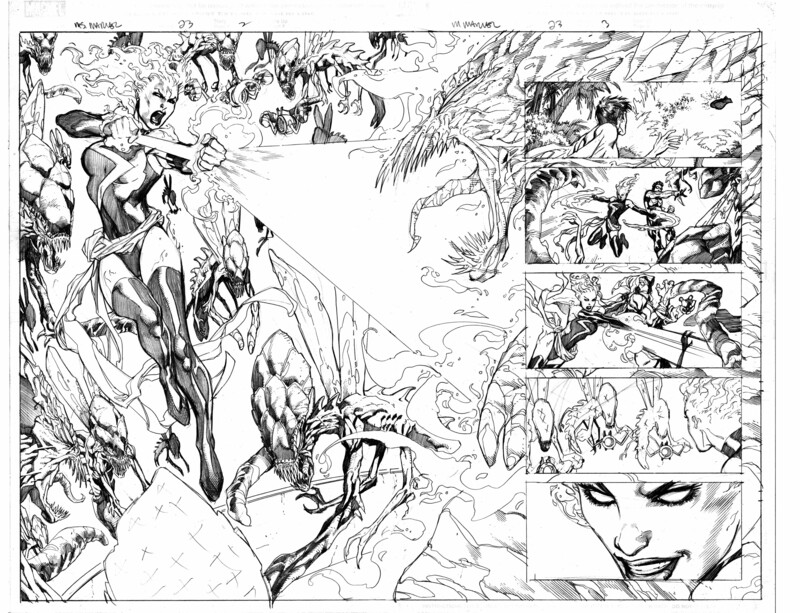 Ms. Marvel/Binary blasting a bunch of Brood? I must be in heaven! 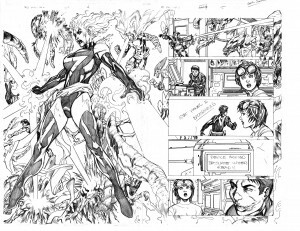 How do you follow up an opening double page spread? 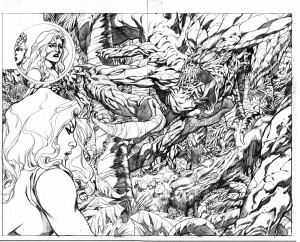 With another double page spread, of course! This is essentially the same scene so I had to come up with another different shot of Carol blasting away. I am really happy with how this four panel sequence turned out. 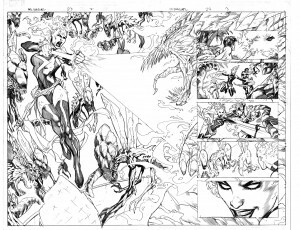 If you are going to have two double page spreads in a row, you might as well make it three! 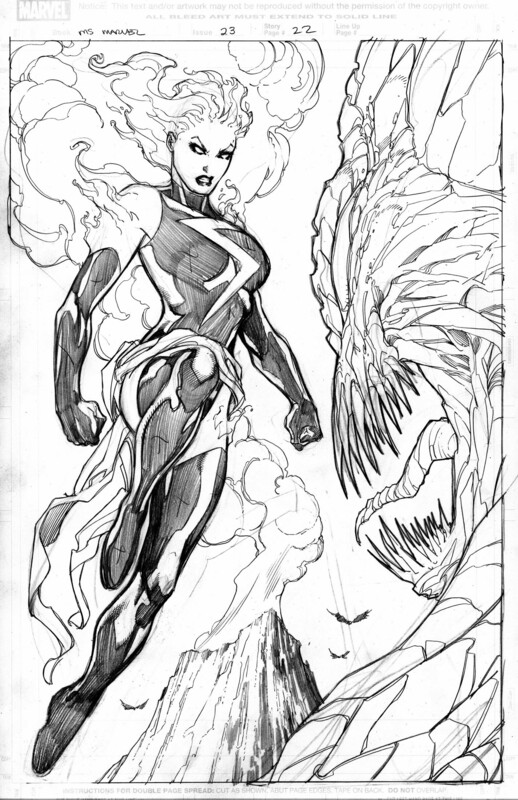 Here we see Ms. Marvel going super-nova or some such thing. 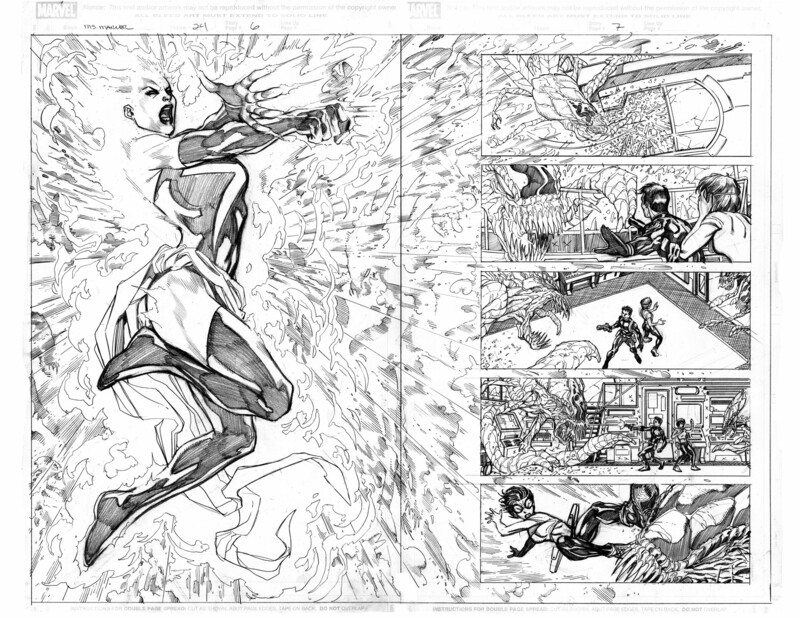 As you can see all three concurrent double page spreads are harmonious in their layout. 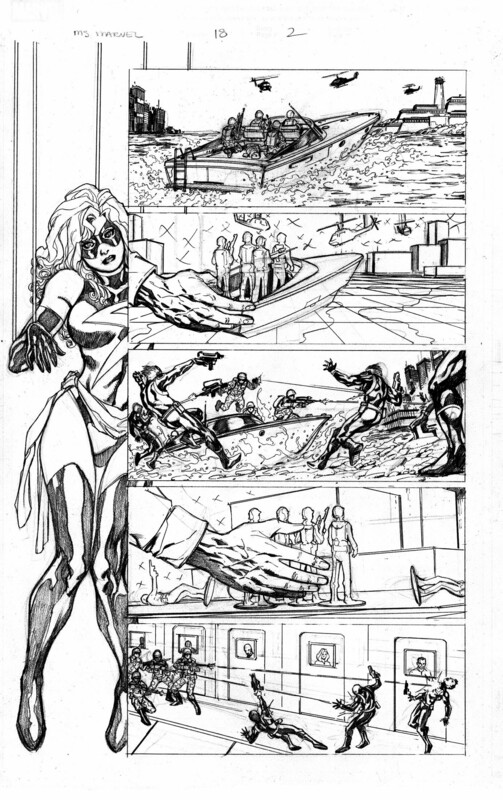 The right side panels tell the story of what is going on inside the hover craft ship while the splash’s of Ms. Marvel let the reader now what is raging on just outside the ship. 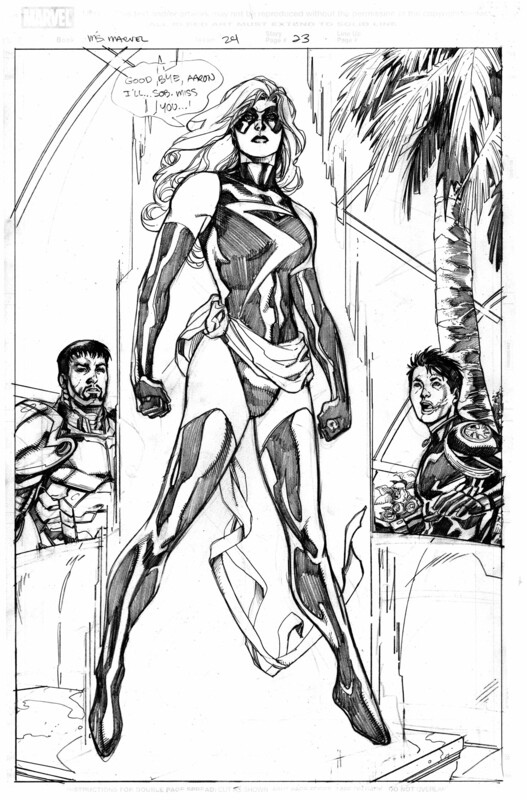 Finally we finish the issue and my run on the series with a full splash of Ms. Marvel. 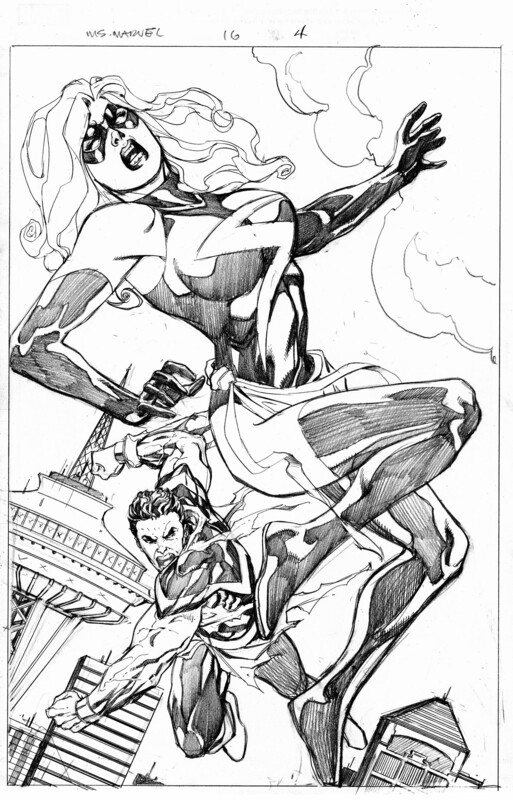 In the story this is a holographic projection but who cares, It is still me drawing Ms. Marvel! This story lead right into the Secret Skrull invasion epic that Marvel ran through the Avengers and other titles. So my final issue had three double page spreads and a full page splash. Not quite the death of Superman but still pretty awesome. 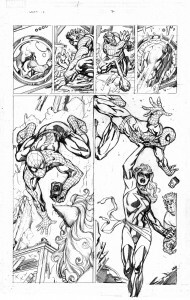 All in all, I drew 11 issues and in those 11 in issues I drew 38 splash pages or double page spreads. That is a pretty good ratio if you are an artist. 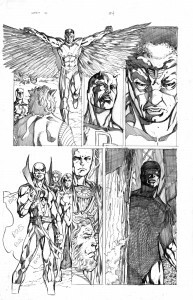 Thanks go to Brian Reed for such great scripts and also to Matt Ryan who did a wonderful job inking the series. 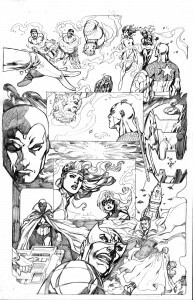 I hope you enjoyed this walk back through memory lane with me because next time we are going further back with Mystic (if I have enough remaining scans). I’m back taking a look at my splash pages from my run on Ms. Marvel from several years ago. 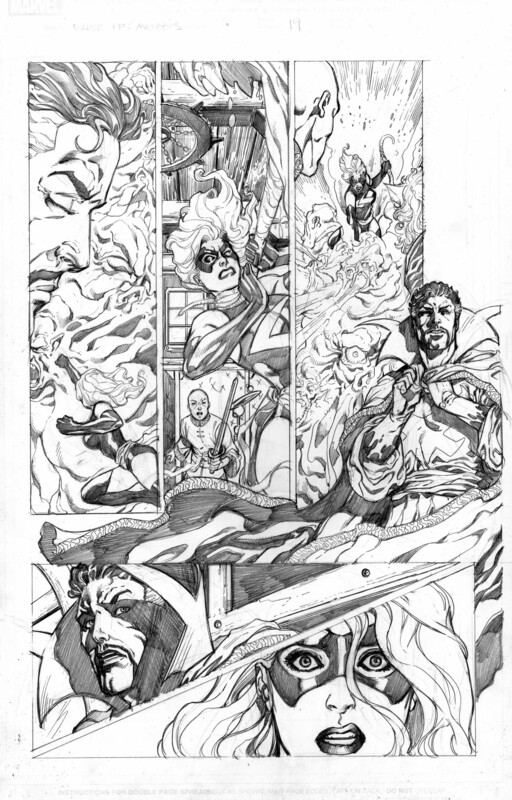 When I first went back and re-examined all the issues I had drawn, I noticed that there was an inordinate amount of splash pages. 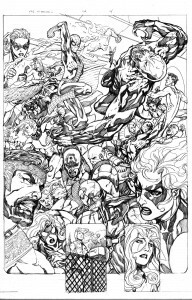 In a way, those splash pages defined the series for me. For that reason I am posting and discusses just the splash pages from my run rather than any number of panel pages that might have some merit as well. Last time we left off with issue #17 so it makes perfect sense to me to begin with issue #18. 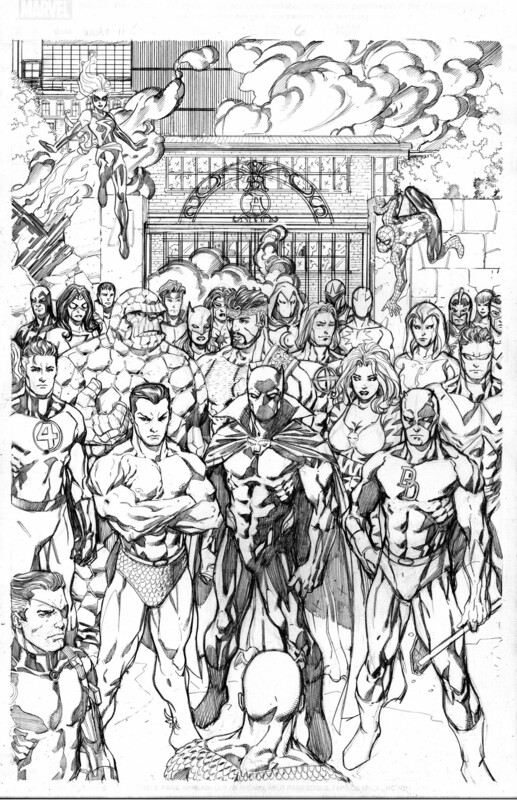 Issue #18 had only one splash page written in and it was at the end of the issue. It featured Spider-girl (or whatever her name was) unconscious in a crate. Not too exciting so I am not posting it here. What I am posting is page one which was not written as a splash page but I did manage to turn it in to one. 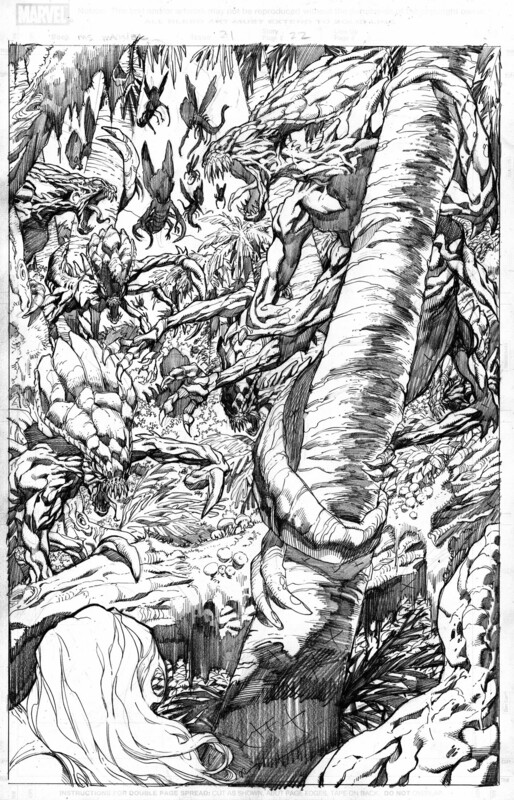 By this time I had established a reoccurring theme of this type of splash page through out the series so it was a given that I would continue the trend with this one. Since the story was about the Puppet Master I wanted to incorporate and image of Ms. Marvel that tied into that idea. Thus I came up with what writer Brian Reed called, “Puppet Carol”. By using a large full figure image of Ms. Marvel as a framing device, I was able to get the cool factor of a splash page but still present the story telling of the panel page that was originally written. 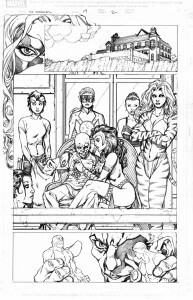 With issue #19 I had a nice big panel of the Puppet Master and some of his mind controlled female characters to work with but I didn’t want to lose the established theme of Ms. Marvel as a framing device so I incorporated the head shot of her up in the corner. I didn’t go full figure because I didn’t want to compromise the middle panel which I felt deserved full size treatment. 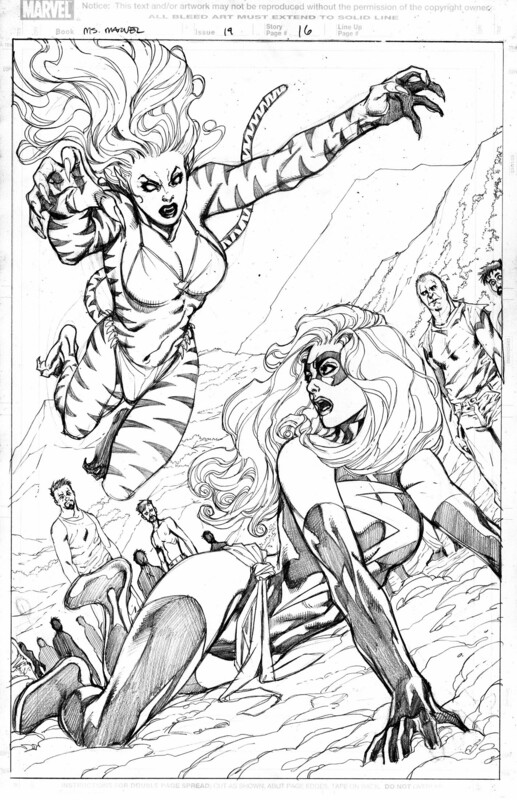 I am not too happy with the splash page of Tigra attacking Ms. Marvel. It’s design is too obviously manipulated to make it a sell-able page and not really a good job of artistic execution. 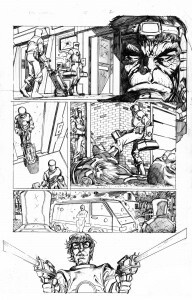 Page 18 features a huge shot of The Sleeper only because I love the look of the character. This was written as a three panel page with the emphasis on panel 1 but I took it to the extreme to really showcase a character that for whatever reason I really like. The fact that is the most important panel on the page in terms of story content, only supports my decision to go big. With issue #22 we return to me making a splash page out of a panel page. This time I added Ms. Marvel 3/4 figure and made all of the black on her costume a star field which then blended in with the star field surrounding her. 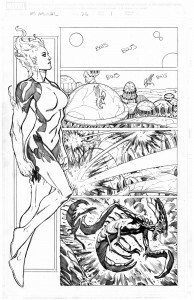 Since she was communing with an alien on this page it made sense to me to go “outer space” with the design. 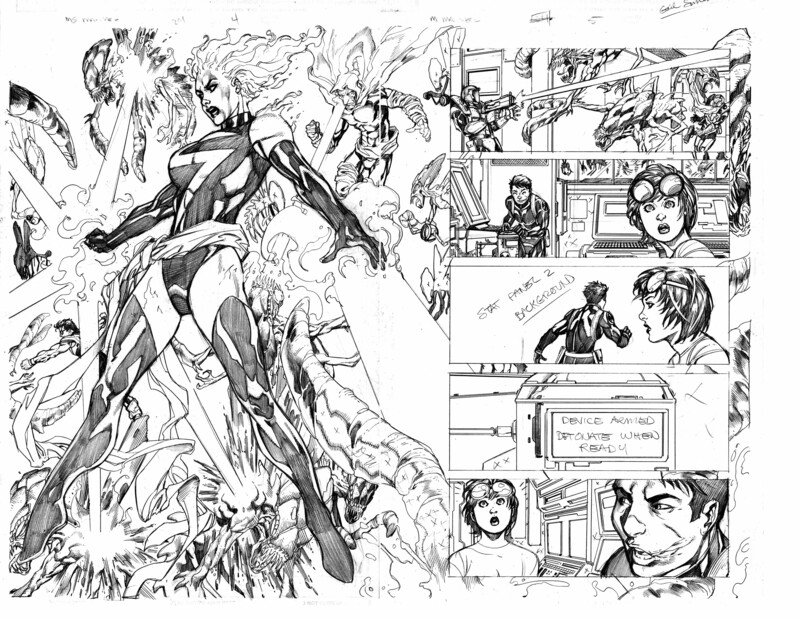 Then on pages 2/3 I got a dynamic double page spread. 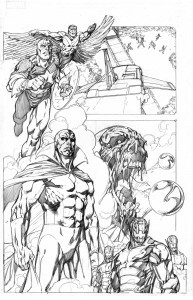 The challenge was that it was essentially the same scene as the last page of issue # 21. 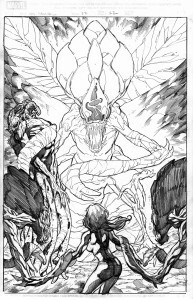 So I had to change the angle and feature one of the Brood more prominently as it was reaching forward to attack. 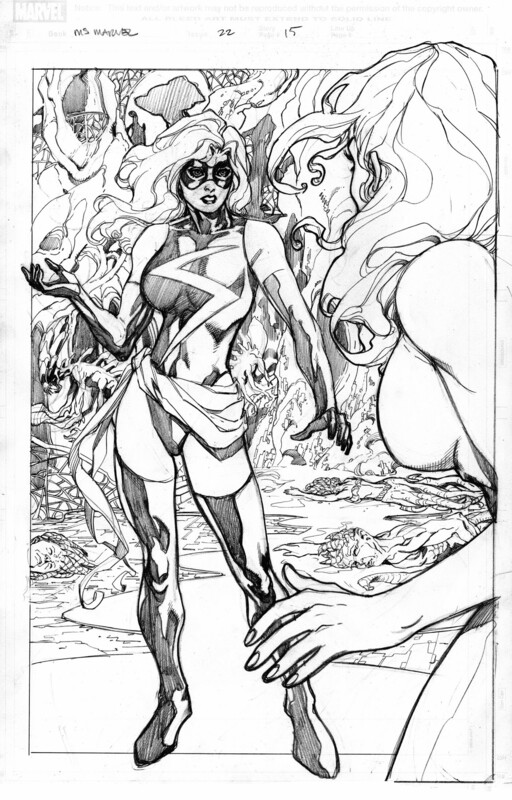 The third splash page of the issue was one of Carol facing off with herself as Ms. Marvel. This is pretty basic with the appeal being a full figure shot of Ms. Marvel. Looking at it now, I may have made her a little too muscular but what the heck. 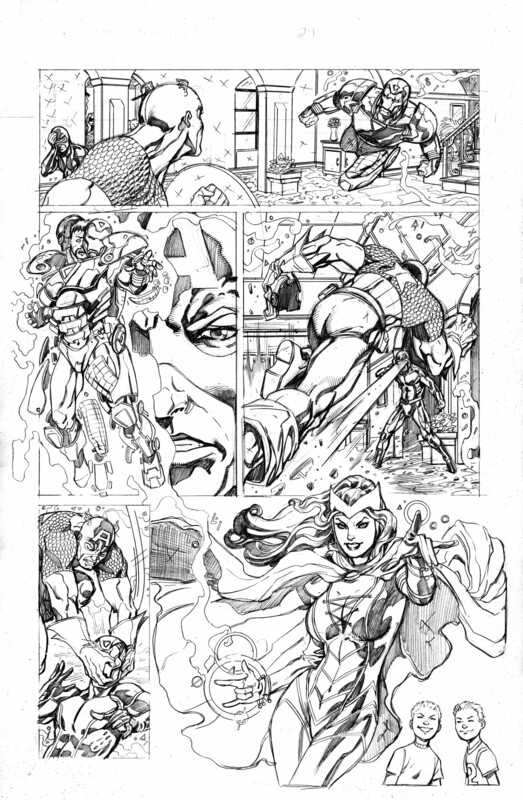 This issue featured a remarkable 4 splash pages and this is the last one on the last page. The crystallized Brood Queen facing off with a captured Carol Danvers is the subject matter and featuring the towering Brood Queen in this fashion seemed like the obvious choice. I wasn’t going to go to a part 3 with this particular blog subject but there is just so much art and subsequent commentary to go with it, I am going to have to. 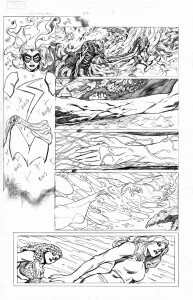 So come back soon for part 3 of my Favorite Projects: Ms. Marvel Spash Pages! Let me take a moment to interrupt our regularly scheduled programming to give you a Power Cubed update. 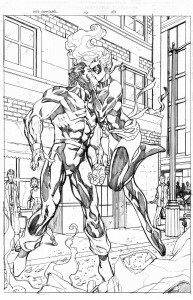 At this point I was hoping to have the first issue completely drawn and inked. Alas, I have only reached page 11 the halfway point to the first issue. I still should be able to finish this mini-series by the end of the this calendar year and have the book out in comic shops by Spring 2015. But as I promised last time, here is another page of finished artwork from the first issue. 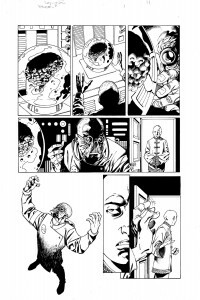 Those of you who actually bought and read the first issue of Atomic Toybox way back in 1999 might remember a similar page from that issue where Dr. Cruel is trying to converse with the brain. That is one of the very few scenes that I didn’t change from the original story. I did alter it slightly and re-draw it, of course. 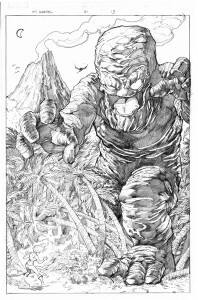 Here is the new version that will appear in Power Cubed #1. Next time you hear from me on Power Cubed the first issue will be complete and I will have more art to post. 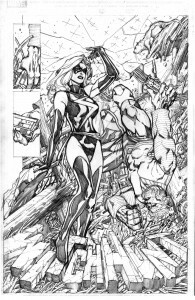 In the interim I will return to the regular programming when I revisit my Favorite Projects: Ms. Marvel Splash Pages part 2! 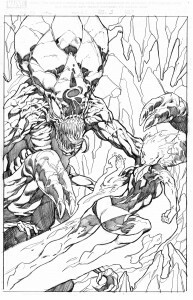 The splash page of a comic is always a challenging thing. It has great importance because it is in essence a single panel on a page that must move the story forward and at the same have great visceral impact. 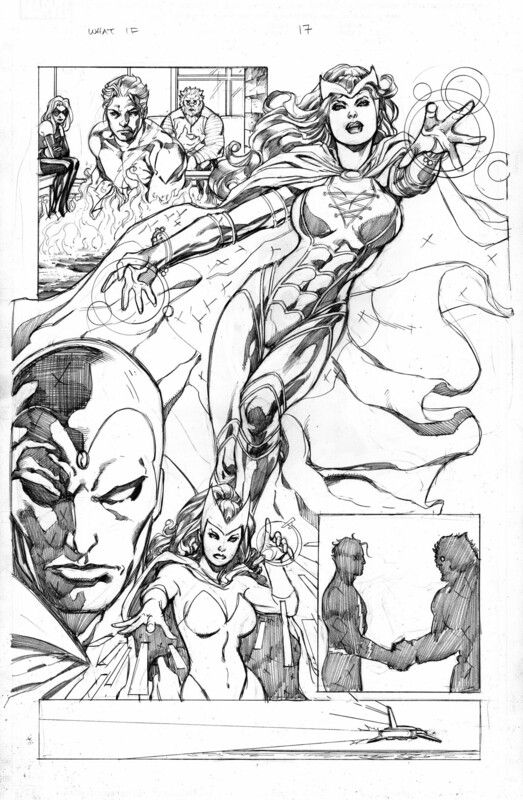 Sometimes you get the first page of a comic that is not written as a splash page but instead it is used to set up a splash that is coming (often times as a double page spread) on page 2 and 3. Then there are those occasions where you just get story and no splash until the end of the issue or sometimes not at all. 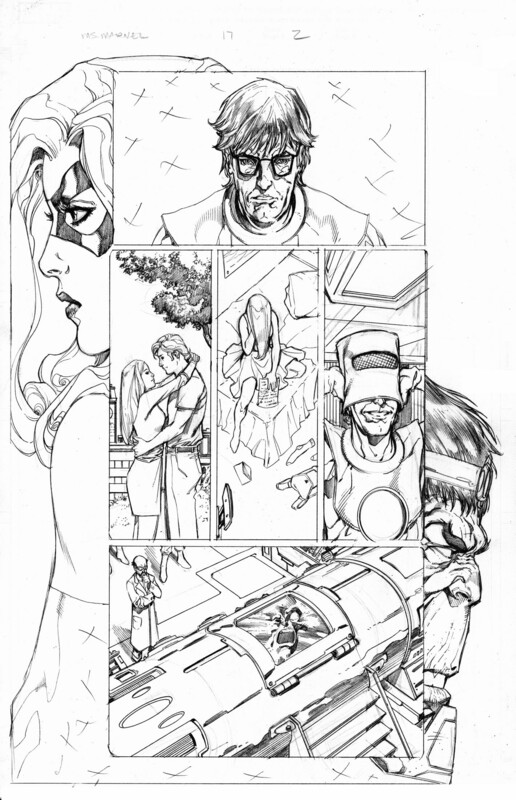 When I was drawing Ms. Marvel for Marvel Comics 7 years ago or so, I had a combination of those situations. 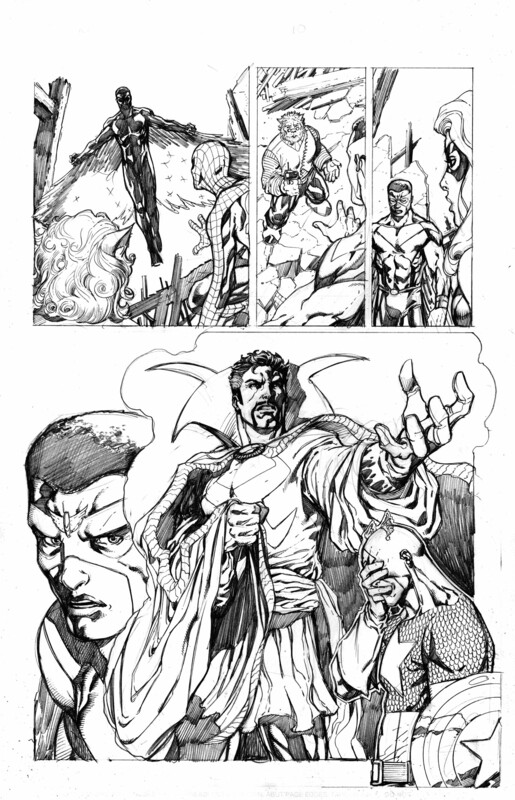 Often times I had first pages that were story pages and were not followed up with a splash page. I have always felt (Stan Lee influence) that a story should always begin with a splash or at least a set up page followed by a splash page to immediately draw the reader in. So when I get handed a script that doesn’t mesh with my philosophy, I will often times try and turn a basic story page into a splash page. 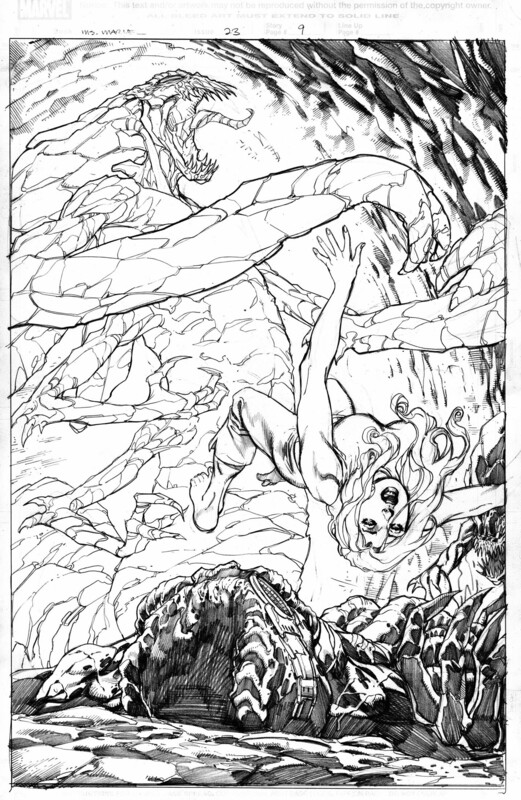 This happened to me with several issues of Ms. Marvel and I did my best to turn a non-splash page into a splash page. 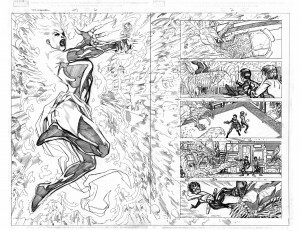 Going through my files on Ms. Marvel I found a lot of splash pages that I still feel are very strong, so let’s take a look at some of those as they appeared in the initial pencil stages. 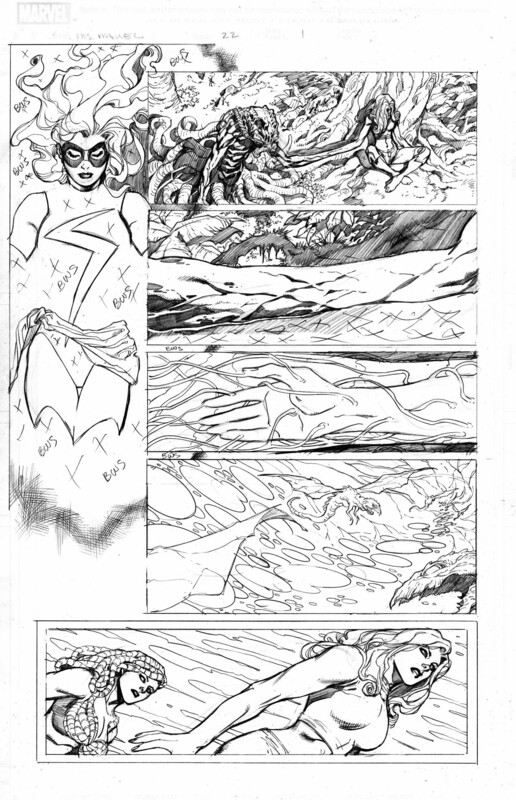 These two pages are from my first issue of Ms. Marvel, #13. 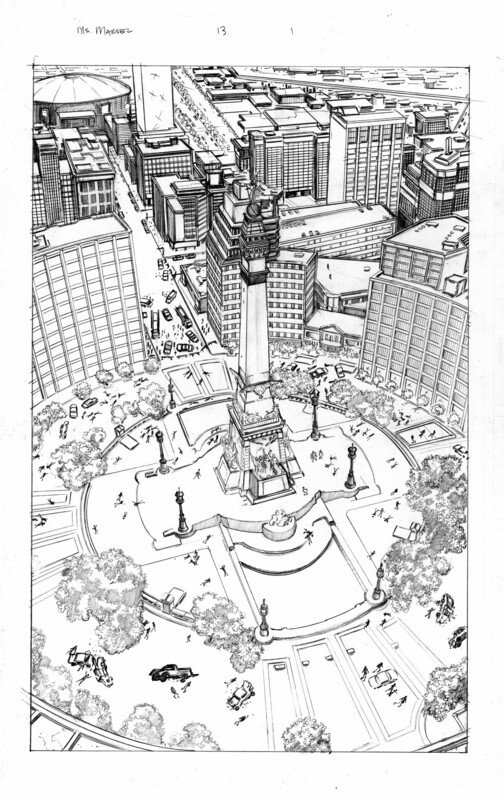 Page one was a splash page of downtown Indianapolis. 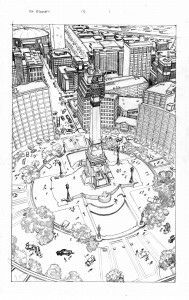 Looking back I still feel pretty good about how it turned out, especially considering how much I hate drawing buildings! This rather uneventful splash page was thankfully followed up with a cool splash of Ms. Marvel punching Iron Man. Now you’re talkin’! 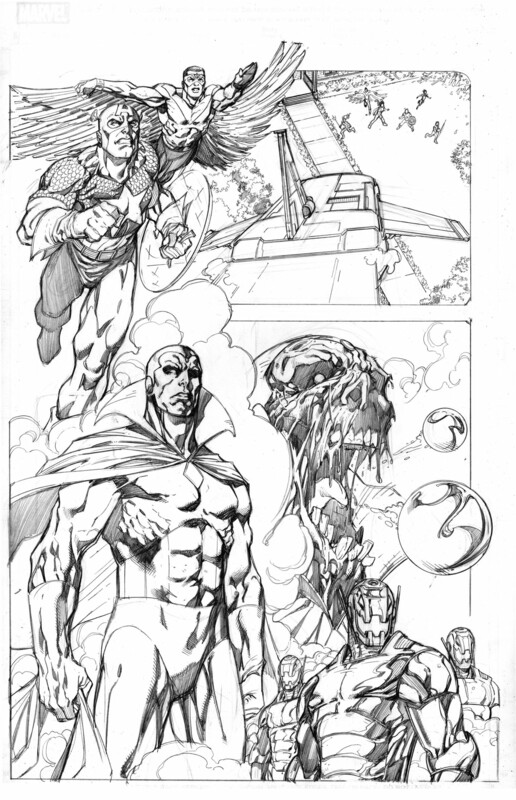 In issue #14 we get the first example of me turning a non-splash into a sort of a splash page. 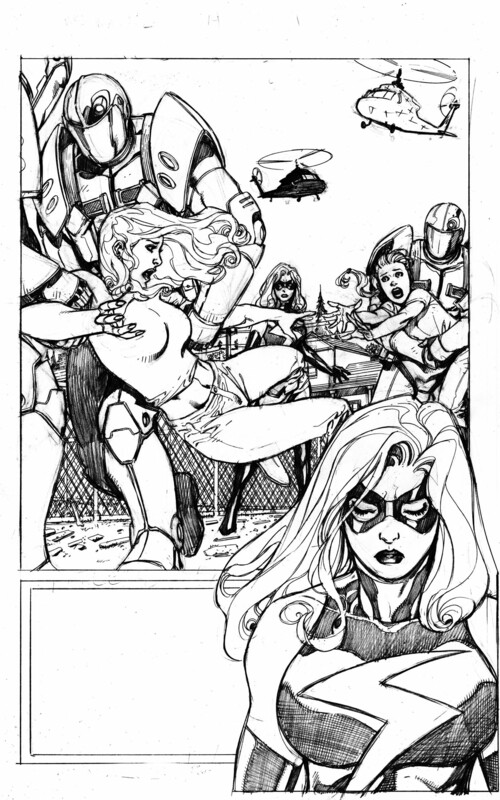 I thought armored guards separating a woman from her child was not the kind of super drama I could hang my hat on so I made the close up of Ms. Marvel really large and overlapping the initial panel. The result is a faux, Ms. Marvel splash. 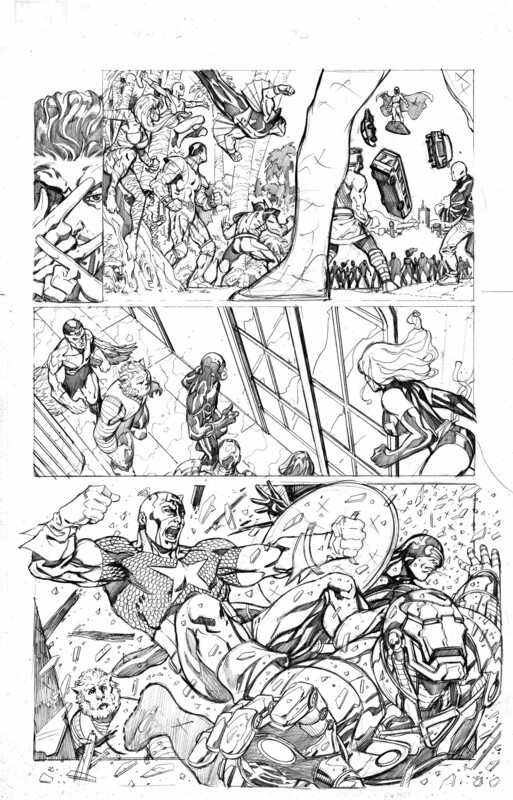 As you can see, a few pages later I get a splash page of the Marvel Universe duking it out with each other. Certainly subject matter worthy of a splash. 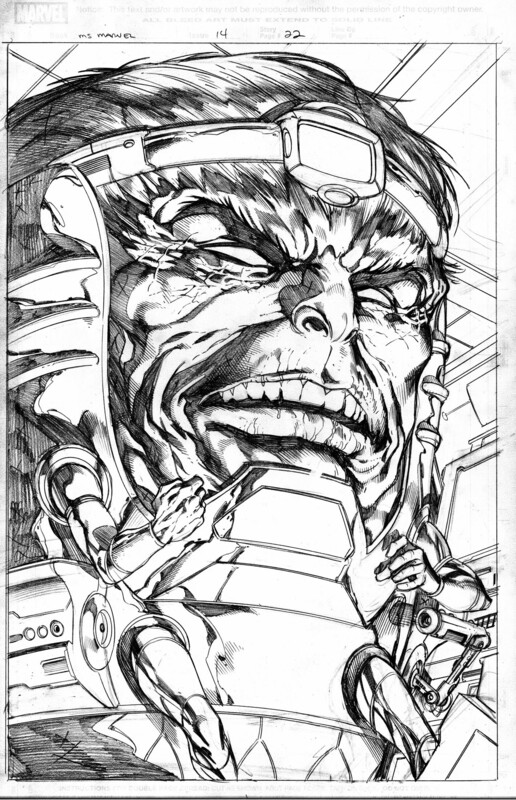 The issue ended with a great splash page of Modok, the surprise villain of the story arc. I love this character and I think it showed on this page. 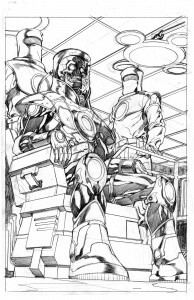 In issue #15, again we open the issue with a non-splash but it was a set up page for a Modok storyline, so I incorporated a “background” shot of him to make the page look cooler but also reinforce the idea that the events on the page directly tied in to him. 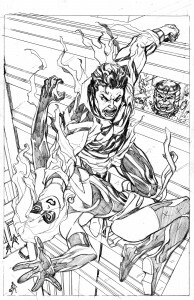 In this issue, the money shot of a mind controlled Wonder Man battling Ms. Marvel happened on the last page. 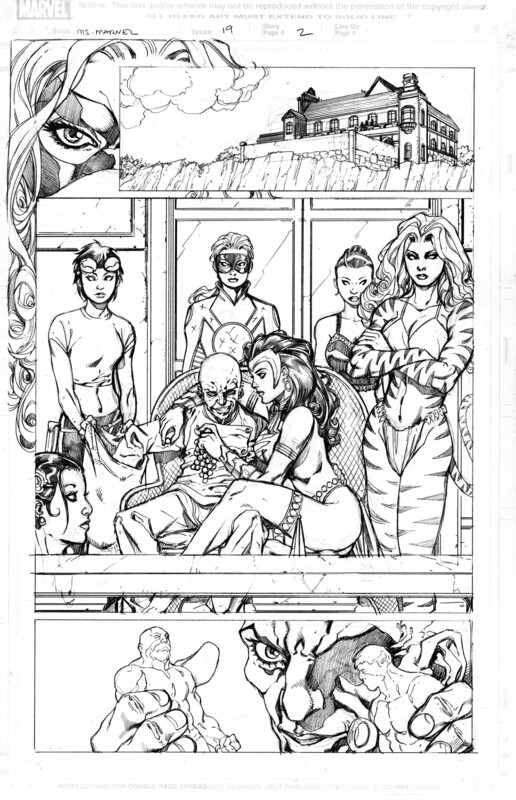 In issue #16, again, the issue opens with a panel page. This time with a conversation. 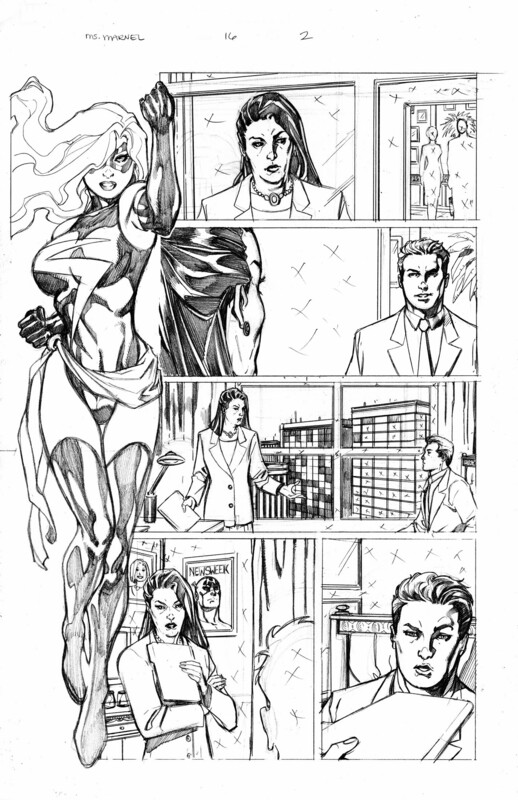 I could not let this open the issue so I drew a full figure of Ms. Marvel on the side and slid the panels over slightly to the right to give her room. Even though this shot of Ms. Marvel is not written in and has nothing directly to do with conversation on the page, it lets the reader know immediately whose comic this is and gives them a reason to look twice and turn the page. Once they do turn the page, they are rewarded with a splash of Power Man smacking Ms. Marvel as the story picks up where the previous issue left off. 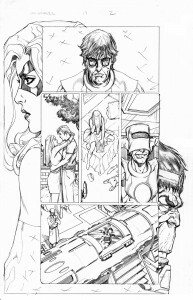 I deliberately turned Ms. Marvel toward the reader in what is really an unnatural position for her to be in after being punched but I always try to think what does the reader really want to see and in this case I felt everyone would want a big cool shot of Ms Marvel, even it it was a little forced. 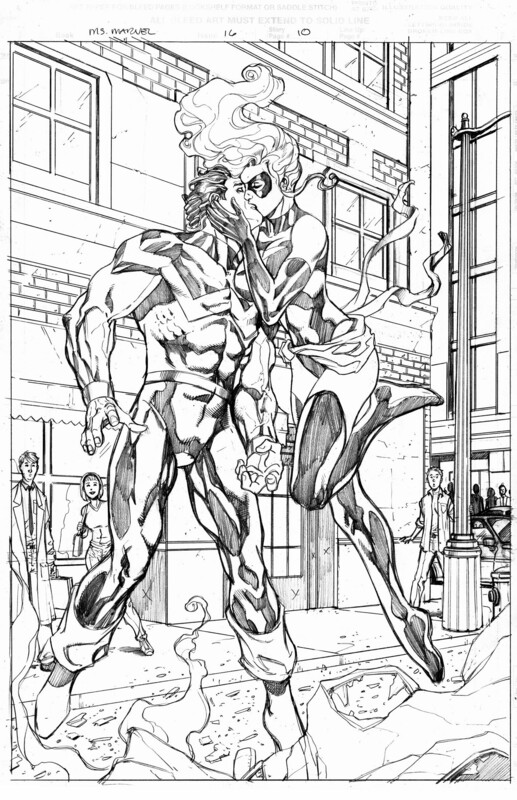 It is important to note that about mid-way through the issue writer Brian Reed threw in another splash of Ms. Marvel kissing Wonder Man. Although, not an action page, it is a really important moment between the characters and a great call to make splash page out of it. In issue #17 we find the Modok story arc coming to an end. 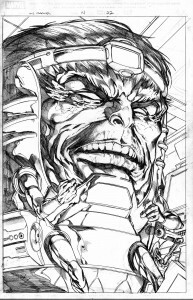 Brian Reed opened the issue with a short re-cap of Modok’s origin. Once again, I couldn’t just leave well enough alone. I balanced the origin panels with big book end shots of Ms. Marvel and Modok to frame the page. It gives this page a splash page feeling without actually being one and it can be easily justified from a story telling standpoint because the story is really about the conflict between the two characters. 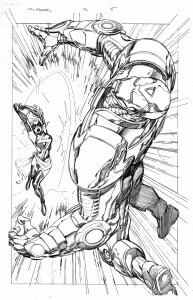 Later in the issue, Wonder Man saves an unconscious and falling (and physically distorted) Ms. Marvel. 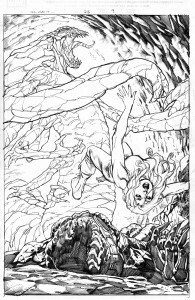 This was not designed to be a splash page but I essentially turned it into one by emphasizing the moment where Wonder Man catches and saves Carol. It is a bigger moment than just a rescue because of the feelings they have for one another. The only true splash page of the issue occurs on the last page where Modok’s son gets resurrected as a new super-villain. Has this character appeared anywhere since this page? 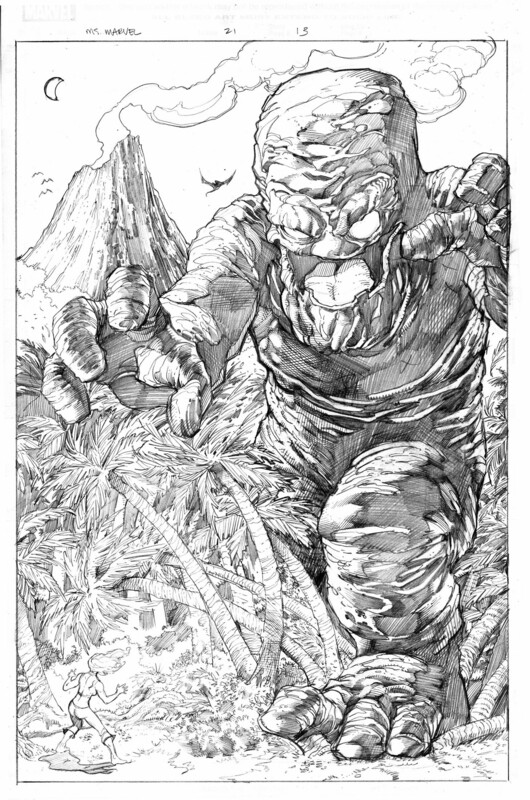 In my next blog instalment, I will continue my discussion of the Ms. Marvel splash pages where Carol Danvers faces off with the always creepy Puppet Master and takes a trip to Monster Isle! Stay tuned! 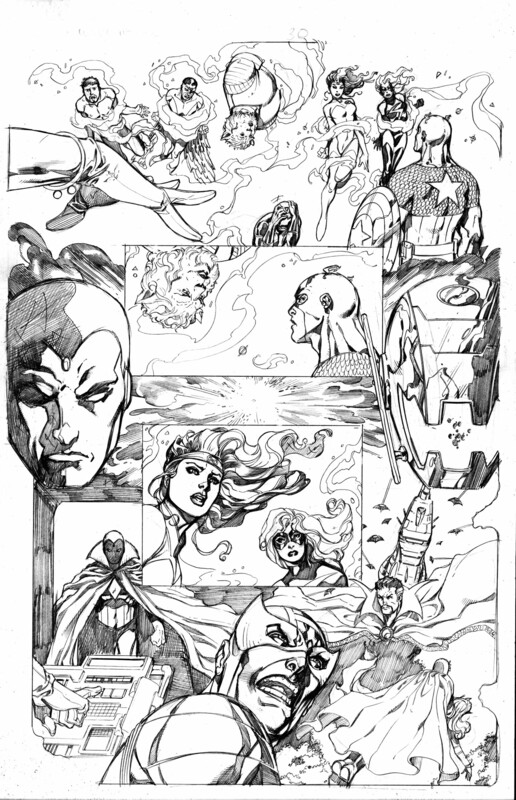 Recently I was going through some old computer files, a sort of cyber house cleaning, and I came across a folder containing the penciled pages I drew for a Marvel Comics project called “What If…Avengers Disassembled”. 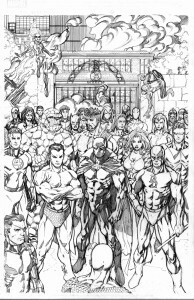 This was a one-shot that took an alternative look at the wildly popular Avengers Disassembled story line from about 8 or 9 years ago. It isn’t very often that I can look back on old work of mine and be pleased with it but this is definitely an exception. This is one of those “dream” projects where you get to draw a bunch of your favorite characters involved in a lot of cool action sequences. 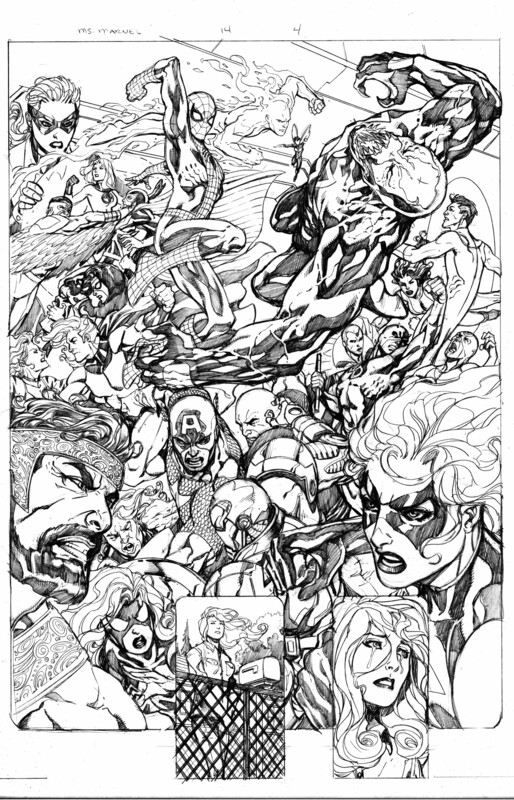 In this case, I got to draw every major Marvel character and a lot of minor ones that I loved growing up (and still do). 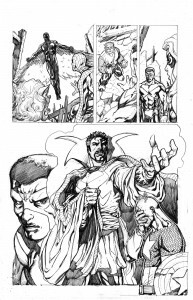 Jeff Parker wrote the issue and I am sure had as much fun with it as I did. I am mainly singling this issue out because I think not a lot of readers out there saw it or knew I was associated with it. It is definitely a worth while pick up if you can find a copy. One interesting side note to this issue; I got the Ms. Marvel regular series based off of my handling of the character in this issue. In my career timeline, I think this issue was squeezed in between my run on Planet Hulk and my run on Ms. Marvel. 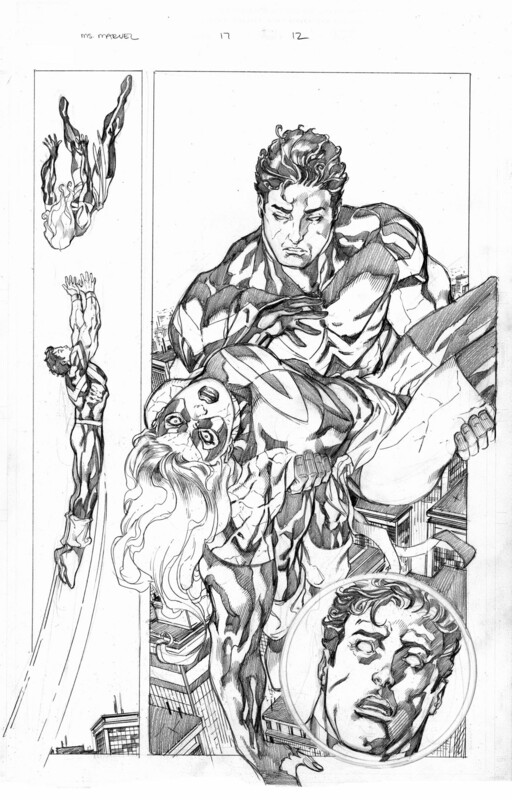 Let’s take a look at some of my penciled pages. 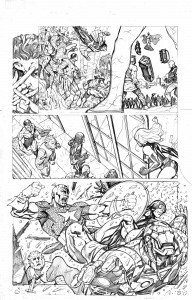 In this three page sequence I got to draw Ms. Marvel, The Beast, Captain America and the Falcon, the Vision and Ultron. 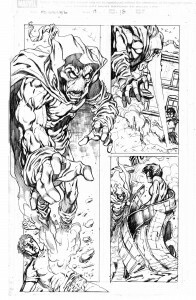 And this was just 3 of the first 4 pages of the issue! I kept page 2 of this sequence. I can’t say why exactly except that I liked it. 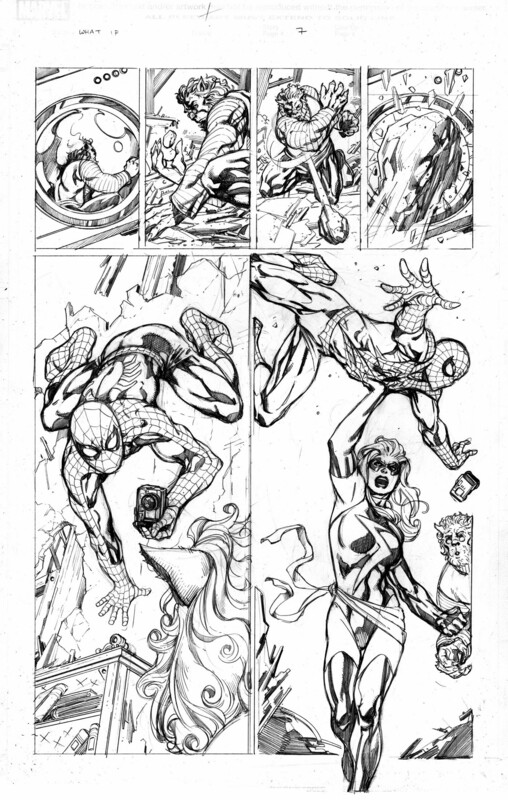 It only took to page 6 for me to get the opportunity to draw the entire Marvel Universe (well practically) and then on page 7 Spider-man shows up! Then by page 10 the Falcon shows up and I get to draw a huge shot of Dr. Strange. As I sit here typing this blog it occurs to me that this just might be the ultimate Marvel comic. 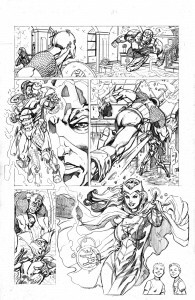 Here is page 17 featuring a massive pin-up shot of the Scarlett Witch with a nice big head shot of the Vision and a nice smaller shot of classic Scarlett Witch as a bonus. Thank you, Mr. Parker! Here is another groovy Dr. Strange page. I always liked this character in his original incarnation. Maybe it is the flowing cape but he certainly presents a lot of artistic opportunity. Cap busting through a window into Iron Man? Again, what a great comic to draw! I could easily posted every page to this comic but I had to exercise some restraint. These are the last two I will post. 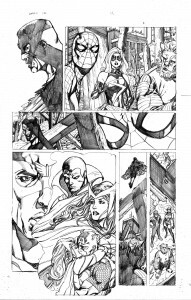 These two pages feature such an array of characters it almost overwhelms your senses. 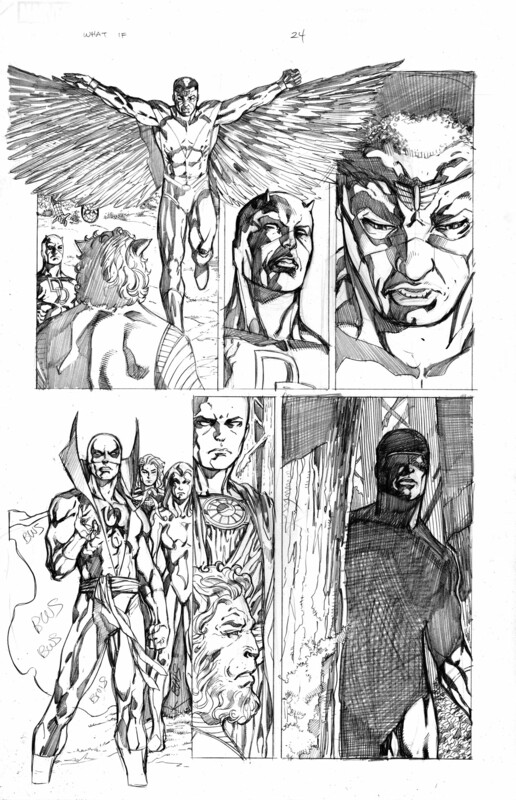 Looking back on all of the pages to this issue I realized at how I really got creative with my story telling. 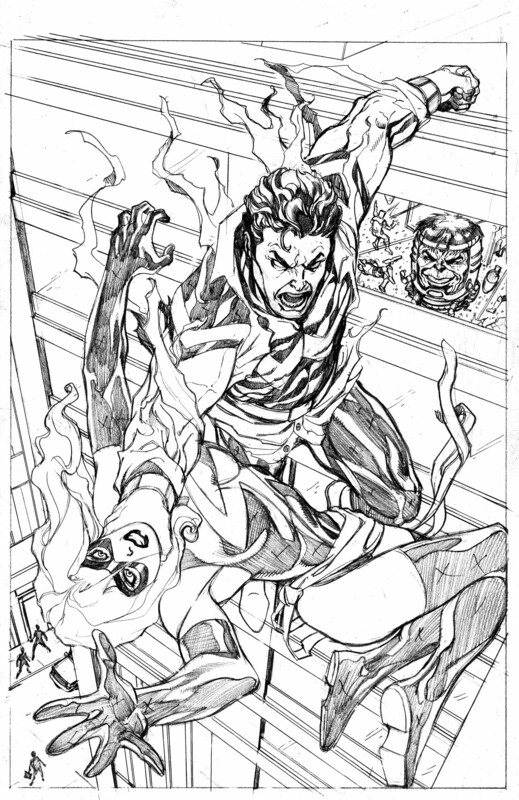 I don’t know if the subject matter was liberating or what but there is definitely some crazy layouts going on. I don’t always think that is a good thing as wild layouts can distract from the flow of the story by calling attention to themselves. But right or wrong it sure was fun!